LTT 303E is an ideal tripod turnstile for regulating personnel and visitor traffic in areas where aesthetics is also important concern such as government buildings and conference venues. 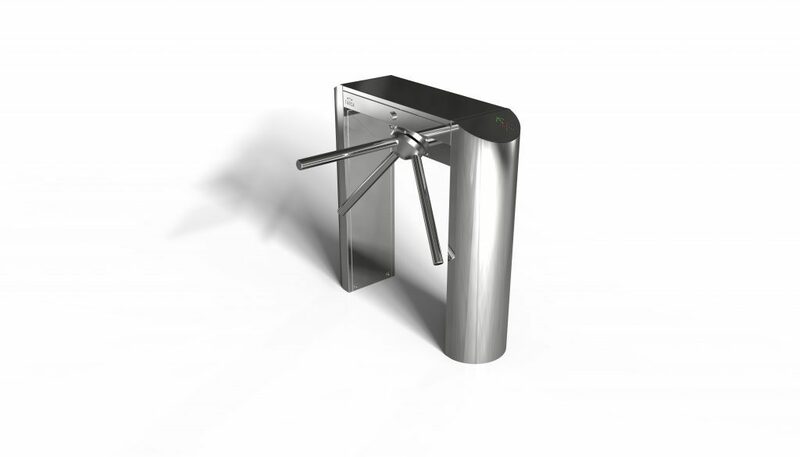 TANSA turnstiles are designed to excel in both internal and external environments. However, for applications in very humid or dusty settings, custom-designed turnstiles with optional features are available if the appropriate specifications are provided at the time of the order. TANSA turnstiles are ideal for both unidirectional and bidirectional passages which can be free or access- controlled. Even though access in both directions can be controlled by a card-reader, authorized security personnel can override that setting for card-free access during certain times of the day. TANSA turnstiles allow free exit out of the site or the building in case of a power failure, a feature mandated by law. If the client wants the turnstiles to remain locked during such an emergency, such functionality can be provided as an option, contingent upon the written request of the client. However, once set at the factory, the system then cannot be switched back to the emergency-exit state by the client and it remains locked during all subsequent power failures. The rotational direction of the turnstile arms during entries and exits is regulated by internal sensors. The smooth centering of the turnstile arm after a pass-through is accomplished by a spring mechanism and hydrolic shock absorbers. For emergency situations like fire or earthquake that necessitate rapid evacuation, TANSA turnstiles come with optional drop-arm turnstile arm which is actuated by a signal received from the earthquake detection system. That ensures quick and safe exit from the building or the site. In a similar manner, the arm can drop off to the side with one push of a button during protocol events to allow unimpeded access for VIPs and special guests. The head of the turnstile is aluminium cast. The arms are made of polished aluminium. When visitors pass through, their clothing naturally brush against the turnstile arms. Because of their bright polished-aluminium construction, TANSA turnstile arms resist this wear and tear, always looking top-of-the-line. OPERATION Works in both directions for entry and exit. HEAD and ARMS Aluminium cast head treated with CNC. Polished aluminium arms. FEATURES • Bi-directional access information monitored by electronic microprocessor. • Adjustable opening and closing intervals, configured via electronic card. • Faster pass-through possibility thanks to the memory mode. MECHANISM Monoblock construction mechanism with stainless steel AISI 304 certified control cams. POWER SUPPLY 110 Vac 60 Hz Switch mode supply. Max 20 Watts operational power. Max 12 Vdc internal voltage. ENVIRONMENTAL SPECS 14 F / 122 F (-10 / +50 C°) temperature range. Can operate even in -40 C° with thermostat-equipped external heater. Rated for Max 95% humidity. Manual-operated turnstiles offer regulated entry and exit of personnel or visitors to any site or area. Access right can be denied or granted remotely. All mechanical hardware and electromechanical control systems are manufactured at TANSA’s own production plants.